Today's computer chips spend a lot of time on probability-based calculations, from your Amazon recommendations to determining fraudulent credit card purchases. By using probability instead of 1's and 0's, those statistical calculations can be done more simply, efficiently, and faster. Lyric Semiconductor has rewritten microchip functionality from scratch. Instead of building a chip using digital logic NAND gates, their chip will use probabilities as inputs to a Bayesian NAND gate. The output of a Bayesian NAND gate represents the chance that the two input signals match. So what does that mean? Fewer gates needed, fewer computations needed... A smaller chip would do the same job of today's chips at a faster rate. For flash memory (found in portable gadgets like smart phones and tablets), error checking chips are one of the biggest bottlenecks for performance and capacity. 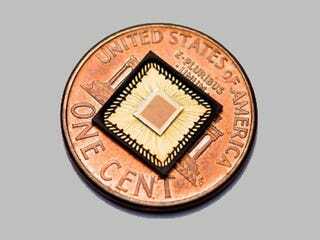 Lyric's chip would take up a 30th of the space and use a 12th of the energy of a typical error correction chip today. A general purpose prototype, the GP5, is planning on being released within the next 3 years, and Lyric hopes to see their error correction chip built into everyday devices within the next two. DARPA is interested in using this technology to work with information that isn't clear cut—distorted radio signals and other "James Bond type" applications. For the rest of us, we may get to see the benefits of their inclusion in future generations of smartphones.